I made another "Wave" bracelet ~ this time in copper. I really like this design and am considering making a necklace. What do you think? 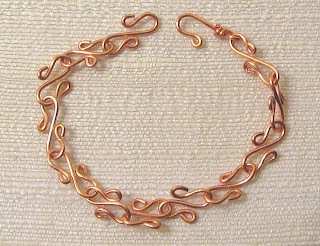 Aside from that, I had my class with Penny this morning, and finished up a necklace with a spiral pendant that I made myself. We also LOSed (Liver of Sulphur) it, which gives it a slightly tarnished, antiquey look. I'll put a picture of that one up later.